Peace came. Peace lived. Peace died. Peace rose again. 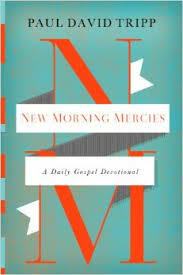 On February 16 Paul David Tripp in New Morning Mercies: A Daily Gospel Devotional (get this book now btw!) writes the following that I wanted to pass on. This is the good news of the gospel. Peace came. Peace died. Peace lived. Peace rose again. Peace reigns on your behalf. Peace indwells you by the Spirit. Peace graces you with everything you need. Peace convicts, forgives, and delivers you. Peace will finish his work in you. Peace will welcome you into glory, where Peace will live with you in peace and righteousness forever. Peace isn’t a faded dream. No, Peace is real. Peace is a person, and his name is Jesus. What’s Your Understanding Of Personal Conflict? What difference does it make for your anger that Jesus died on the cross?